"GMC Yukon XL Denali" redirects here. It is not to be confused with GMC Denali. In addition to the Chevrolet brand, the Suburban was produced under the GMC marque until its version was rebranded Yukon XL, and also briefly as a Holden. For most of its recent history, the Suburban has been a station wagon-bodied version of the Chevrolet pickup truck, including the Chevrolet C/K and Silverado series of truck-based vehicles. Cadillac offers a version called the Escalade ESV. Several automotive companies in the United States used the "Suburban" designation to indicate a windowed, station wagon type body on a commercial frame including DeSoto, Dodge, Plymouth, Studebaker, Nash, Chevrolet, and GMC. The (Westchester) Suburban name was, in fact, a trademark of U.S. Body and Forging Co. of Tell City, Indiana, which built wooden station wagon bodies for all of these automobile and light truck chassis and more. Chevrolet began production of its all-steel "carryall-suburban" in 1935. GMC brought out its version in 1937. 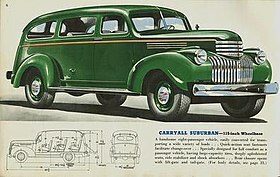 These vehicles were also known as the "Suburban Carryall" until GM shortened the name to simply "Suburban". 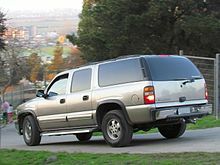 GMC's equivalent to the Chevrolet model was originally named "Suburban" as well, until being rebranded as "Yukon XL" for the 2000 model year. With the end of production of the Dodge Town Wagon in 1966 and the Plymouth Fury Suburban station wagon in 1978, only General Motors continued to manufacture a vehicle branded as a "Suburban", and GM was awarded an exclusive trademark on the name in 1988. The Chevrolet Suburban is one of the largest SUVs on the market today. It has outlasted competitive vehicles such as the International Harvester Travelall, Jeep Wagoneer, and the Ford Excursion. The latest competitor is the extended Ford Expedition EL, which replaced the Excursion. The Suburban of today is a full-size SUV (upgraded to extended length from 1967 onward to make room for the then-new K5 Blazer that debuted in 1968) with three rows of seating, a full pickup truck frame, and V8 engine. It is one of the few station wagons available with all bench rows. The Suburban is the same height and width as the Chevrolet Tahoe, although the Suburban is 20 inches (510 mm) longer. The extra length provides a full-sized cargo area behind the 9 passenger seating area. From 1973 to 2013 it had been available in half-ton and 3/4-ton versions, the latter discontinued after the 2013 model year, but was revived in 2015 as a fleet-exclusive vehicle for the 2016 model year. In recent years, the Suburban has been used as a police truck, fire chief's vehicle, or EMS vehicle. Suburbans are also used as limousines. Gothic black Suburban vehicles are commonly used by federal intelligence services, such as Secret Service for example. 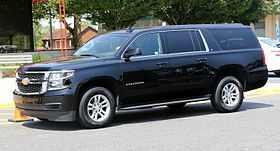 Secret Service operates fully armored versions of the Suburban for the President of the United States when he attends less formal engagements. In the late 1990s, GM also introduced a RHD version of the Suburban, badged as a Holden, for the Australian market. Sales were low and GM withdrew the model in 2000 from Holden's lineup. There have been twelve generations of Chevrolet Suburbans since its 1935 debut, the most recent (starting with the 2015 model year) entering showrooms in February 2014. In 2015, Chevrolet celebrated the Suburban's 80th anniversary with the Arlington Assembly plant unveiling the ten millionth vehicle built at the facility since its 1954 opening, a black 2015 Suburban LTZ. This marked the second time in the Suburban's history that it has achieved this honor, as the tenth generation Suburban from the 2011 model year was also the nine millionth vehicle built there. In 2015, the Suburban commemorated its 80th anniversary at General Motors Arlington Assembly Plant where the 10 millionth Suburban was produced. A video was posted on Chevrolet's YouTube channel about its eighty-year legacy. 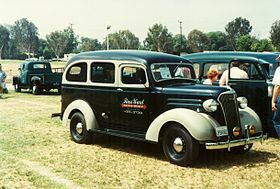 Prior to this first generation Suburban, in 1933 Chevrolet had offered a station wagon body, built on the 1/2 ton truck frame. This model was specifically built for National Guard and Civilian Conservation Corps units. Much of the body was constructed from wood, and could seat up to eight occupants. The actual first generation model was offered by Chevrolet as a "Carryall Suburban" – a tough, no-nonsense load carrier featuring a station wagon body on the chassis of a small truck. Focused on functionality, the concept was literally to "carry all": the whole family and their gear were to find sufficient space in one truck. It shared the front sheetmetal and frames of the 1/2 ton pickup models of the same year, but featured all-metal wagon bodies differing very little in shape from contemporary "woodie" wagons. Seating for up to eight occupants was available, with three in front row, two in the middle row, and three in the rear row. Either the side-hinged rear panel doors or a rear tailgate/lift window could be selected for cargo area access. This model generation was based on the Chevrolet Advance Design series of pickups. Beginning in 1953, the Hydra-Matic 4-speed automatic transmission was available in GMC models and in the 1954 model year Chevrolet Suburbans. Models with rear panel doors were designated "3106," while those with tailgates were designated "3116." In 1952, the Suburban came with either a tailgate or panel doors. The front bench seat was split, with two seats on the driver's side and a single seat on the passenger side, which slid forward for access to the rear two rows of seats. The second row was a "2/3" seat, requiring occupants to move past the front passenger seat, as well as the second-row seats to access the third row. This was the last series to feature "Canopy express" models. 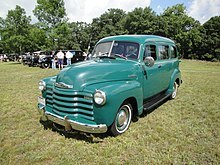 The design of the 1947 Suburban would inspire the design of the Chevrolet HHR over half a century later. Engines included I-6 and the small block V8s. Chevrolet used its 265 V8 engine, later evolving it to a 283-cubic-inch version. GMC based their V8 on a Pontiac design. Standard Suburban model numbers continued from the previous series, but the introduction of four-wheel-drive models in 1957 added the numbers "3156" for 4WD Suburbans with panel doors, and "3166" for 4WD Suburbans with tailgates. 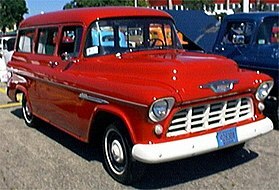 The "Suburban" name was also used on GM's fancy 2-door GMC 100 series pickup trucks from 1955–1959, called the Suburban Pickup, which was similar to the Chevrolet Cameo Carrier, but it was dropped at the same time as Chevy's Cameo in March 1958 when GM released the new all-steel "Fleetside" bed option replacing the Cameo / Suburban Pickup fiberglass bedsides. The Suburban name was never used again on a 1/2 ton pickup after the discontinuance of the Suburban Pickup. 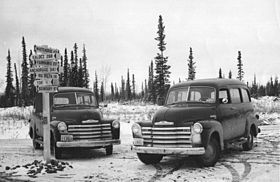 Although not documented due to a fire which destroyed the records, the production of Suburban Pickups is understood to be 300 or fewer each model year it was offered from 1955-1958. The styling of the 1960 – 1961 model year took cues from the late 1950s Chevrolet vehicles and had large oval ports above the grille. Front independent suspension was new for 1960. The cab featured a "wrap around" windshield. Tailgate and panel door rear openings were available. From 1962 onwards, the hood styling was more conservative, with hoods that eliminated the large ports. In 1964, the front glass area was updated to a flatter windshield and larger door glass. 1,150 lb (520 kg) of cargo could be carried in the back. This model series introduced a factory-equipped 4WD ("K") option for the first time. The 2WD ("C") models introduced a torsion bar-based independent front suspension and trailing arm and coil spring rear, but by 1963, returned to a more conventional coil-spring approach. Engine options included I-6 and small-block V8s. A 305 cu in (5.0 L) GMC V6 engine was also available on GMC models. This 305 was actually from GMCs medium-duty truck line. It featured high torque but was also notable for poor fuel economy. Transmissions were a 3-speed and 4-speed manual, the automatic Powerglide and the dual-range Hydramatic in the GMC models. A 15-passenger conversion was done by Stageway of Fort Smith, Ark. These modified Suburbans had three doors on the right, a 171 in (4,343 mm) wheelbase, were 273 in (6,934 mm) long, and weighed 6,300 lb (2,858 kg). One ton (C-30), 10-foot (3 m) panel truck models were no longer available after 1966. The 6th generation Suburbans featured a single driver-side door and two passenger-side doors, and were available in both 2WD and 4WD models. Engines offered over the six model years included the 250 and 292 CI inline 6, 283, 307, 327, and 350 CI small block V-8, and 396/402 CI big block V-8. For the first time, a three-quarter ton version was available. 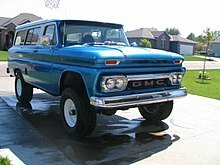 It also became a larger size vehicle as well with the introduction of the K5 Blazer that debuted in 1968 for the 1969 model year. This series would also be the last to offer C-10 & C-20 panel truck models for commercial purposes, with 1970 as the last year. 1971 models featured disc brakes on the front wheels, and 1972 was the last year for coil-spring rear suspension on 2WD models. 1972 also introduced a smaller housing for the rear seat air conditioning (a unit that ran the full length of the roof had been available since 1967). The Comfort-Tilt steering wheel became optional in 1971. This generation of Suburban coincided with the rapid growth of the recreational vehicle market. While only about 6,200 Suburbans were produced in 1967, by 1972 that number had grown to some 27,000. In 1964, Chevrolet in Brazil introduced a 5-door version of the Suburban called C-1416 (known as Veraneio from 1969 onwards, which is Portuguese for "summertime"). It was based on the contemporary Brazilian Chevrolet C-14. Like the C-14, the C-1416/Veraneio used the instrument cluster from the US C/K series although the exterior sheet metal layout is exclusive to Brazil. It was initially powered with a Chevrolet 4.2 L inline six based on the pre-1962 "Stovebolt" engines. Later it used the 250-cid 4.1 L engine from Chevrolet's Brazilian mid-size sedan – the Opala. The original version of the Veraneio was kept in production, with another grille and interior, until 1988 (model year 1989), but it was eventually replaced with an updated version based on the Série 20 family. The second generation of Veraneio was produced from 1989 to 1995. In 1997 GM introduced in Brazil the North American pickups for the local market, replacing the "C Series". The Brazilian version of the Suburban was also converted to the current generation at the time and lasted until 2001, was called the Grand Blazer, a successor to the Veraneio. The 4.1 L inline six engine with 138 hp (103 kW) was offered on both models with option for a MWM 4.2 L turbodiesel unit with 168 hp (125 kW). In 2015, Autoweek ranked the Veraneio fourth among the Chevrolet station wagons that America never got. It also cited the vehicle's design as "baroque" and summed it up as "It's a 1960s Brazilian crossover." Autoweek notes that The Veraneio can be imported to the United States, depending on the condition of the vehicle. With the third generation Rounded-Line C/R & K/V models, the Suburban became a four-door vehicle. 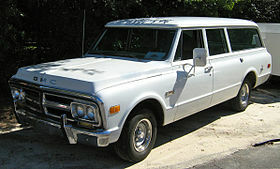 The Rounded-Line 1970s body style remained largely unchanged for 19 model years – making this series the longest Suburban generation in production. 2WD (C/R) and 4WD models (K/V) were both available in 1/2 and 3/4 ton ("10" and "20") chassis. Suburbans for model year 1973 now had two doors on each side (the previous generation had just one door on the driver's side), front-and-rear air conditioning, a baggage rack, a heater under the third seat and step-plates for easier access. A new Eaton Automatic Differential Lock was introduced as an option extra for the rear differential. For the 1973 model year the base engine was the 250 CID inline six (100 net HP), with a 307 or 350-cubic-inch small block V8 (115 or 155 net), or the new-for-1973 454 CID big block V8 (240 net HP) optional. The 307 V8 was dropped for 1974, supplanted by the 305 and 400 small block V8's in 1976. The 400 was dropped after 1980, leaving the 350 as the only available engine in K-series Suburbans as the 454 was not yet offered in 4x4's. 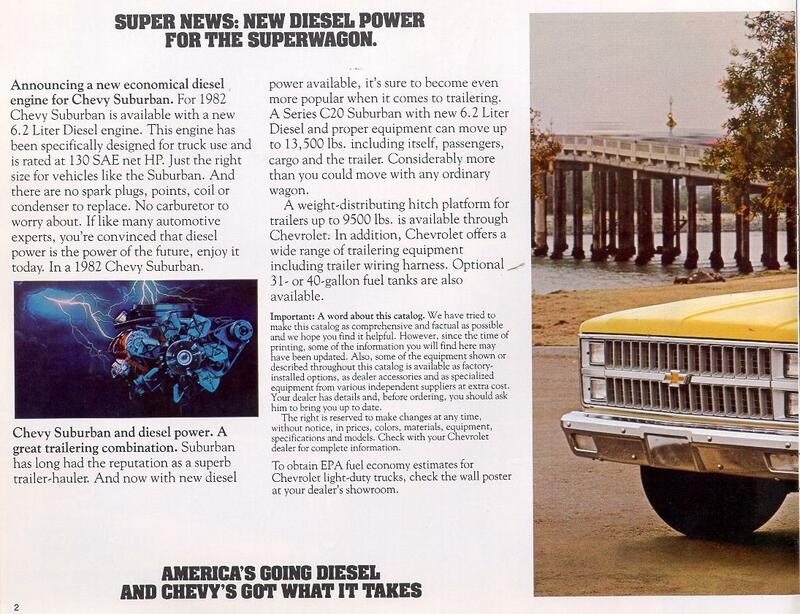 In 1982 a new 6.2 L (379 cu in) Detroit Diesel V8 engine was available, producing 130 horsepower and 240 lb.-ft. of torque. The Diesel later became the engine of choice for Suburbans exported to Europe from USA. Except for the discontinuation of the 305 V8 in '88 the engine line-up continued mostly unchanged, with the 350, 454, and 6.2 diesel, until the Suburban was redesigned onto the GMT400 chassis in 1992. Three-speed Turbo Hydra-Matic 350 and 400 automatic transmissions were available, and the four-speed Turbo Hydra-Matic 700R4 was introduced in 1981 and was available with the small block and 6.2-liter diesel. Towing packages, with lower axle ratio and heavy-duty cooling additions, were optional. Trim options included base (Scottsdale) level and upgraded Silverado versions. An optional 3rd row bench seat allowed for nine-passenger configurations. A rear heating system was optional. For model year 1981, automatic locking front hubs were added for shift-on-the-move four-wheel drive models, and the NP208 transfer case replaced the NP205 in most models. For 1984, asbestos was removed from rear brakes. For 1985, a new grille was used. A total of 64,670 Suburbans were made in 1985. For model year 1987, the method of fuel delivery for the engines was switched from carburetors to electronic fuel injection. (However, for the 454 cubic inch or 7.4 liter displacement engine, carburetors were still made available along with electronic fuel injection for the 1987-1989 model years). The system that GM chose was called throttle body injection, or TBI. Suburban gained rear-wheel anti-lock braking system (ABS) for the 1990 model year. A heavy-duty four-speed automatic transmission, the 4L80-E was added for 1991. Also for 1989, the grille was redesigned to accommodate a quad side-by-side headlight setup and larger marker lights/turn signals than the previous dual filament single headlight setup, which was styled concurrently with the GMT400 light duty trucks. Economy models (usually for fleet usage) were available with only two headlights (again, based on the base model C/K series). GM temporarily changed the usual "C/K" designation to "R" and "V" for the 1987 through 1991 model years. This was done to avoid confusion with the GMT400-based Chevrolet C/K pickup trucks, which were introduced in 1988, during the overlap period. 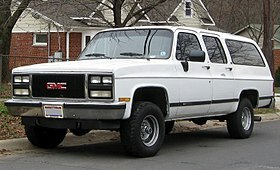 The GMT400-based Suburbans were introduced in December 1991 for the 1992 model year. The similar pickup truck models had switched to the newer platforms in the 1988 model year. Both 2WD and 4WD models, designated "C" and "K", were offered, as well as half ton and three-quarter ton ("1500" and "2500") models. The base engine for all variants was the small-block 5.7 liter (350 cu in) V8. The big-block 7.4 L (454 cu in) V8 was optional for the 2500 series. The optional 6.5 L Turbo diesel was available on all models – though rare on the 1500 series. The 6.5 L Turbo diesel used in the Tahoe was detuned to 380 lb⋅ft (520 N⋅m) torque due to the limitation of the 8.5-inch (220 mm) axle capacity. 1500 Suburbans with the 6.5 L Turbo diesel used the 14 bolt axle from the 2500 series. Ground clearance was 6.9 inches, the approach angle was 18 degrees for the K-1500 (28 degrees for the K-2500) and the break over angle was 18 degrees. Transmissions included the 4L60 four-speed automatic in the 1500 series, and the heavier duty 4L80 four-speed automatic in the 2500 series and the 1500 series fitted with the 6.5 L Turbo diesel. The manual transmission option from the previous generation was dropped. The GMT400 series introduced independent front suspension. The 2WD models used coil springs and 4WD models used torsion bars in the front suspension. All models used a live axle and leaf springs in the rear. 0–60 mph time for a 1995 Suburban was 9.3 seconds. Top speed of a 1995 Suburban is governed on the engine for economy. A maximum of 98 mph (158 km/h) can be obtained. City fuel economy was 13 mpg‑US (18 L/100 km) and highway was 15 mpg‑US (16 L/100 km). The turning circle was 47.8 ft (14.6 m). In 1996, fuel economy had improved to 17 mpg‑US (14 L/100 km) highway. Trim options included a base-level version, the LS, and the LT. Interior seating arrangements allowed for either bucket or bench seating in the first row, and optional third row bench. The vehicle could be configured from two- to nine-passenger seating. In Australia and New Zealand, Holden imported the right-hand drive Chevrolet Suburban built by GM in Silao, Mexico, between February 1998 and January 2001. The Suburban was first previewed in October 1997 at the Sydney Motor Show. In total, 746 were sold (460 petrol and 286 diesel). After 2001, subsequent models reverted to the original Chevrolet brand, which had also been used before 1998. Over the model's lifetime there were three trim levels: a base model, the LS and the LT. Not to be confused with the trim variants is the model code, designated K8. The Holden's interior differed from that of the American version, whereby the dashboard of the Chevrolet Blazer was used instead. However, it had to be stretched to fit in the larger Suburban. A bench seat came standard on the entry-level variant as well as the LS, but the more expensive LT received bucket seats. With the omission of the center seat, the LT has a maximum seating capacity of eight, compared to nine. Creature comforts standard in all models included a LCD compass in the rear-view mirror, a tilt adjustable steering wheel, a driver's airbag, ABS brakes, and dual-zone air conditioning. The second tier LS brought alloy wheels, power windows and mirrors among some features. To further up the ante, the LT gained electric front seats, leather trim, and a horizontally slated, two-part tailgate. This came as opposed to the "barn doors" found on the other specifications. The Suburban was offered with the choice of either a 5.7-liter Vortec V8, producing 190 kW (255 hp) and 447 N⋅m (330 lb⋅ft) of torque, or a 6.5-liter turbodiesel V8 outputting 145 kW (194 hp) and 583 N⋅m (430 lb⋅ft). The former choice was designated the "1500" name, while the turbodiesel saw the "2500" identify. The 5.7-liter petrol engine is LPG-compatible, and such systems can be retrofitted if desired. Regardless of the engine specified, the truck was equipped with a four-speed automatic transmission. However, what differed was the type of transmission. Petrol motors were fitted with the GM 4L60-E transmission, with the GM 4L80-E reserved for the diesel. A dashboard switch allows the vehicle to power all four wheels simultaneously, or the rear wheels only, and allows the low range gearing to be engaged. The vehicle's fuel efficiency has been rated at 19.7 L/100 km (11.9 mpg‑US) for the diesel specification, with that figure rising to 21.8 L/100 km (10.8 mpg‑US) for the petrol model. With the hefty fuel consumption comes a 159-liter fuel tank. To combat the extra payload and towing capacity of the diesel, an improved braking package, as well as super heavy duty axles and suspension were fitted. Holden recommends a maximum 3,400 kilograms (7,500 lb) towing limit for the turbo diesels, with a reduced figure of 2,720 kilograms (6,000 lb) for the petrol models. The Holden Suburban's run actually wasn't the first or only time that Holden had sold the GMT400 platform in Oceania. Beginning in 1996, they imported GMC C/Ks for ambulance conversions. Unlike the Suburbans, these vehicles were not available to the general public, nor did they bear Holden badging. They also were not built as right-hand-drives from the factory like the Suburban was; the same company that handled the ambulance conversion (Jacab Ambulance in Tamworth) also switched the steering to the other side. The GMT800-based Suburbans were introduced in late December 1999 (Texas-only) and January 2000 (nationally) for the 2000 model year. They were sold in two series: 1/2-ton 1500 and 3/4-ton 2500. Suburbans came in Base, LS and LT trims. Optional was pushbutton 4WD with low-range transfer case. A tow hitch with trailer wiring plug was optional. For 2000, Chevrolet's long-serving 5.7 L and 7.4 L V8 engines were retired along with the 6.5 L diesel. New engines were Vortec 5300 5.3 L (325 cu in) for the 1500 series and Vortec 6000 6.0 L (364 cu in) for the 2500 series. For 2001, the 6.0 L V8 in 2500-series Suburbans gained 20 hp (15 kW) from a number of changes including aluminum cylinder heads. The new Vortec 8100 8.1 L (496 cu in) V8 was added as an option for the 2500 as well. OnStar became standard on LT models and LS models with the new Z71 package. Quadrasteer four-wheel steering was added as an option on 2500 models only. 2002 saw several optional features made standard equipment on the LS model, including front and rear air conditioning, alloy wheels, power windows, power front seats, side steps, fog lamps, and heated outside rear view mirrors. Base models were discontinued, leaving LS and LT. The Vortec 5300 L59 variant in the 1500 series added flex-fuel capability. The 6.0 engine was not available in the 1500 series. For 2003, all GM full-size trucks received an upgraded interior, with better-quality materials and other enhancements. New radios offered Radio Data System compatibility, XM satellite radio, Bose sound and improved ergonomics. Adjustable pedals were added as an option, and the instrument cluster-mounted Driver Information Center was improved and monitored up to 34 vehicle functions. A Panasonic DVD system was added as an option. GM's Stabilitrak system was added, and Quadrasteer became available on 2500 series Suburbans. Towing capacity for Quadrasteer-equipped vehicles was reduced by 300 lbs (the weight of the system). For 2004, 1500-series Suburbans received the Hydroboost braking system that was previously introduced in the 2500 series. The Mexican-market Suburban received a front end update this year, matching that of the Silverado. The 2005 model year saw the long-standard side-hinged panel doors discontinued in favor of the formerly optional liftgate. All engines switched to an all-electric cooling system to reduce power loss and fuel consumption. The Z71 package, long exclusive to 4WD models, became available on 2WD Suburbans. OnStar also became standard across the board. Finally, Stabilitrak became standard on all models shortly after the start of the model year. the 2005 Suburban 1500 won the J.D. Power and Associates award for highest initial quality among large SUVs, beating out its rivals the Ford Expedition and Toyota Sequoia. For 2006, the GMT800 Suburban's last year, a special LTZ trim package became available, featuring 20-inch (510 mm) wheels, all-wheel drive, and the LQ4 6.0 L engine of the 2500 series of trucks and SUVs. The catalytic converters were relocated closer to the engine. The XM radio antenna and the OnStar antenna were combined into a single unit. Vortec 5300 325 cu in V8 270 hp (00), 285 hp(01-03) 295 hp (04-06)03-06 at 5200 rpm and 335 lb·ft (454 N.m) of torque at 4000 rpm. Vortec 6000 364 cu in V8 (335 hp at 5200 rpm and 375 lb⋅ft (508 N⋅m) of torque at 4000 rpm). Vortec 8100 496 cu in V8 (325 hp at 4200 rpm and 447 lb⋅ft (606 N⋅m) of torque at 3200 rpm). The 2007 model year Suburban and Yukon XL were unveiled at the 2006 Los Angeles Auto Show in January. Production of the redesigned GMT900 Suburban and Yukon XL began at Janesville Assembly and Silao Assembly in January 2006 (Suburban) April 2006 (Yukon XL), with the vehicles arriving at dealerships in April. The interior has a redesigned dashboard and improved seats. It still retains its 9-passenger seating availability, which is available on LS and SLE models only. LT2, and LT3 models have leather seating and available 6-, 7-, and 8-passenger seating. A Z71 package was available on LT2 and LT3 models which includes two-tone leather seats. All Mexican-built Suburbans including the 9-seat models offer the special two-tone leather seating used by the Z71. The Suburban LTZ comes standard with a DVD player, GPS navigation enhanced radio that is touch screen. For the 2010 model year, in which U.S. News & World Report ranked it as the number one affordable large SUV, the Suburban added a premium interior package that includes tri-zone climate control and handy features like Bluetooth and rear audio controls. In addition, radios that are standard in all 2010 trims get a USB port, allowing for music to be played from auxiliary devices though the radio, as well as charging other small electronics. Side blind zone alert becomes an option on LT and LTZ. The 6.0 liter engine in the 2010 models will also be flex fuel capable. Minor front end changes including a slightly raised front bumper and side torso air bags were also made standard for 2010. In February 2010, Chevrolet unveiled a 75th anniversary edition of the Suburban, which will have the LTZ trim with white diamond tricoat exterior paint and cashmere interior, along with standard 20-inch chrome-clad wheels, revised roof rails, integrated navigation radio, XM Satellite Radio, Bluetooth phone connectivity, rearview camera, rear park assist, remote starting, adjustable pedals, and leather upholstery with heated/cooled front seats. Chevrolet says that the anniversary edition will be limited to 2,570 units because of the amount of white diamond paint GM can procure. The 5.3 L and 6.0 L engines carried over, and a new 403 horsepower (301 kW) 6.2 L Vortec V8 was added for the Yukon XL Denali. The 8.1 L engine was dropped. For the 2011 model year, the Suburban will add three new exterior colors to the lineup: Mocha Steel Metallic, Green Steel Metallic, and Ice Blue Metallic. The trims will also get an updated modification, with the rear audio system, Bluetooth, floor console/storage area, wood grain interior, luggage rack rails, body-color exterior door handle/mirror caps and premium-cloth front bucket seats now standard on the 1LS trim, and chrome recovery hooks, two-speed transfer case, and 20-inch chrome wheels standard on its 1LS 4WD models. In addition, the trailering package will feature the trailer brake controller as a standard on all trims. For the 2012 model year, trailer sway control and Hill Start Assist become standard on all trims, while the LTZ trim added a heated steering wheel and Side Blind Zone Alert as a standard. Also, the LT1/2 options for the Suburban and SLE1/2 and SLT1/2 options on the Yukon XL were discontinued, leaving the Suburban with only a LS, LT and LTZ trim and the Yukon XL with a SLE and SLT trim. In 2012, GMC celebrated its 100th anniversary by releasing a special edition of its Yukon XL, offering a Heritage Edition trim package. This would also be the final year that three colors, Graystone Metallic, Gold Mist Metallic and Blue Topaz Metallic, would be offered, along with the all season blackwall P265/65R18 tires. For the 2013 model year, two new colors were offered: Champagne Silver Metallic and Blue Ray Metallic (extra charge). Also new is Powertrain Grade Braking, normal mode. The 2013 arrived for Chevrolet dealers in June 2012. For the 2014 model year, power-adjustable pedals, remote vehicle starter system and rear parking assist along with rear vision camera and inside mirror with camera display will become standard on the Suburban LS trims. In addition, Concord Metallic (which was supposed to be available for the 2013 MY) will be added to the Suburban color offerings for the 2014 models. For the Yukon XL, a convenience package will now become standard on its SLE models, along with a new color, Deep Indigo Metallic. In February 2014, The Suburban came in second behind the Tahoe among the top-ranked large affordable SUVs by U.S News & World Report. This would be followed by being acknowledged as an award recipient in the large SUV category by JD Power and Associates in July 2014. The three-quarter ton model's towing capacity is 9,600 lb (4,400 kg), being one of the best of any 4x4 SUV and Unmatched by any other SUV. The three-quarter ton model also has a GCVW of 16,000 lb (7,300 kg). The 2500 Suburban was originally sourced from Silao, Mexico from 2007 to 2008 but was moved to the Arlington, Texas assembly plant for the 2009 model year, where production of all GM fullsize SUVs was consolidated after the closing of the Janesville plant. GM discontinued the 2500 3/4 Ton versions of both Suburban and Yukon XL models after the 2013 model year. The tenth generation Suburban's design provided the basis for the Declasse Granger and its law enforcement counterparts, a line of fictitious SUVs that are featured in the Grand Theft Auto video game series as of Grand Theft Auto V.
2015 GMC Yukon Denali XL at the Rochester International Auto Show. The eleventh generation Chevrolet Suburban, GMC Yukon XL, and Yukon Denali XL were introduced to the public on September 12, 2013, and GM unveiled the vehicles in different locations (The Suburban in New York, Yukon XL in Los Angeles) on that date. Both vehicles are based on the GMT K2XX platform and will carry unique serial designated numbers, identified by platform (K2), brand (YC for Chevrolet, YG for GMC), drivetrain (C for 2WD; K for 4WD), tonnage (15 for half-ton, 25 for 3/4-ton, 35 for 1-ton), wheelbase (7 for short, 9 for long), and 06 for SUV, which means that a K2YC-K-15-9-06 would be identified as a Chevrolet Suburban 1500 4WD. The Suburban and Yukon XL went on sale in February 2014 as a 2015 model, with the vehicles built exclusively in Arlington, Texas. The newly redesigned Suburban and Yukon XL were showcased to the public for the first time on September 27, 2013, at the State Fair of Texas. This move comes on the heels of the 80th anniversary of the first production of the Suburban in 1934. The designs and concepts were created by GM's exterior design manager Chip Thole (prior to his transfer to GM's Buick design studio in 2013), who told Truck Trend "I start with what intuition tells me about the market and get the team going on that. You look at trends around the industry – fashion, culture, what people are buying, what they say they want now – and project that into the future. The fun part is putting those ideas to paper and going from there." He then added "We wanted to take what was good about today's vehicles, bring that forward and make them new and different with that spark of freshness that people recognize, without making them gimmicky or overdone." Thole also challenged his design team to help bring ideas to the SUVs, which lead to the split headlamps and a more graphic feel for the Suburban design, while a more industrial but sculptured look was added to the Yukon XL to give it a unique identity of its own. Production on the Suburban and Tahoe began in December 2013 with the first completed SUVs being used for testing purposes. GM then officially started shipping the vehicles to dealerships on February 5, 2014. It is estimated that it takes 8–10 weeks to assemble the SUVs, save for the upgrades on the level trims and destination scheduling. Chevrolet introduced the designs, choices and build-your-own features for the 2015 models on its website in January 2014 with a set price starting at $47,000 (2WD) to $50,000 (4WD) for the LS trim, $52,000 (2WD) to $55,000 (4WD) for the LT trim, and $61,000 (2WD) to $65,000 (4WD) for the LTZ trim. The pricing on GMC's Yukon XL's are set at around $49,000 (2WD) to $52,000 (4WD) for the SLE, $57,000 (2WD) to $60,000 (4WD) for the SLT, and $65,000 (2WD) to $68,000 (4WD) for the Denali trims. The front fascias of the Chevy Suburban and GMC Yukon XL are distinct, but from the base of the A-pillars back, they share most of the same styling cues. This now includes inlaid doors that tuck into the door sills, instead of over them, improving aerodynamics, fuel economy, and lessens interior noise. The hoods and liftgate panels are made of aluminum in an effort to reduce vehicle weight, and the wiper blades that were located on the liftgate door were moved to the rear spoiler located on the top of the rear liftgate window. Also noticeable is the SUV's length, which expands from 222.4 to 224.4 in (5,649 to 5,700 mm) (the Yukon XL's length is shorter at 224.3 in (5,697 mm)) and its width from 79.1 to 80.5 in (2,009 to 2,045 mm), while the height decreases from 76.8 to 74.4 in (1,951 to 1,890 mm), thus allowing the vehicle to become slightly leaner, a little bit wider, more streamlined, and roomier. A more-efficient, direct-injected EcoTec3 V8 powertrain (5.3 for the Suburban, 6.2 for Yukon XL/Yukon Denali XL) coupled with improved aerodynamics, helped the SUVs offer greater estimated highway fuel economy and improving its MPG and CAFE estimates to 16MPG (City)/23MPG (Highway)/18 (Combined) for 2WD, and 15MPG (City)/22MPG (Highway)/18 (Combined) for 4WD. The increased MPGs also vaulted the Suburban/Yukon XL into the top spot among large SUVs with the most efficient MPG rating numbers for this segment. However, when Motor Trend (which placed the 2015 Suburban on the front cover of its June 2014 issue) did a road test review on the SUVs, it estimated the 4WD MPG on the Suburban LTZ to be slightly better at around 15.2 City and 22.3 Highway, while the 4WD Yukon Denali XL, whose MPG is rated at 14 City/20 Highway, was estimated lower at 12.4 City and 19.2 Highway. Like the 2007–14 version, both the Suburban and Yukon XL do not share a single piece of sheetmetal or lighting element with the brands' full-size pick-up trucks (GMC Sierra and Chevy Silverado), and the front grilles of both vehicles are slightly altered to give it their own identity. The front headlights features projector-beam headlamps that flanks the Chevrolet-signature dual-port grille – chrome on all models, sweeping into the front fenders, while Tahoe and Suburban LTZ and Yukon and Yukon XL Denali trims feature projector beam high-intensity discharge headlamps and light-emitting diode daytime running lamps. The Yukon and Yukon XL also feature projector-beam halogen headlamps on all SLE and SLT trims. The improved safety features included a 360-degree radar detection for crash avoidance and occupant protection and a high-tech anti-theft system that now includes vertical and interior sensors, in-glass and window breaking, a triggering alarm and a shutdown device that prevents the vehicle from moving. The latter is expected to address the issues regarding the constant thefts of the vehicles, especially with the previous generation's removable seats and items left in the cargo space, which has become a target for carjackers who see the third row seats as valuable on the black market. According to General Motors' head of Global Vehicle Security Bill Biondo, "We have engineered a layered approach to vehicle security," adding that "With new standard features and the available theft protection package, we are making the vehicles less attractive target to thieves and more secure for our customers." Also new are the addition of fold-flat second and third-row seats (replacing the aforementioned removable third seats), which is now a standard feature but can be equipped with an optional power-folding feature for the upgraded trims, and an additional two inches of leg room for second-row passengers. HD radio became a standard feature on all trims. Multiple USB ports and power outlets are now spread throughout their interiors, including one 110-volt, three-prong outlet on both Suburban and Yukon XL, with the Suburban adding an available eight-inch color touch screen radio with next-generation MyLink connectivity along with an available rear-seat entertainment system with dual screens and Blu-ray DVD player, while the Yukon XL adds a standard eight-inch-diagonal color touch screen radio with enhanced IntelliLink and available navigation. A 4G LTE WiFi access system, along with Siri Eyes Free and text messaging alerts, was included into all vehicles that feature the OnStar device around the second quarter of 2014. The Yukon XL interior has more additional features that includes seats stuffed with dual-firmness foam, a standard Bose sound system and SD card slots, and laminated glass for the windshield and front windows, decreasing interior noise. The Denali Yukon XLs comes equipped with active noise-cancellation technology, with GM's third-generation magnetic ride control suspension as a standard feature, which is only featured on the Suburban LTZ models, whose upgraded features also includes a real-time damping system that delivers more precise body motion control by "reading" the road every millisecond, and changing damping in just five milliseconds. The Suburban will have eight color palettes to choose from for the 2015 model year: Champagne Silver Metallic, Silver Ice Metallic, White Diamond Tricoat, Sable Metallic, Crystal Red Tricoat, Summit White, Tungsten Metallic, and Black. The GMC Yukon XL palettes will be available in nine colors: Onyx Black, Summit White, Quicksilver Metallic, Champagne Silver Metallic, Iridium Metallic, Bronze Alloy Metallic, Crystal Red Tintcoat, White Diamond Tricoat, and Midnight Amethyst Metallic. The latter three will be the most expensive color trim options. The Suburban received a new color palette, Brownstone Metallic, and added a hands-free power liftgate feature that is standard on LTZ, but included on LT with the optional Luxury Package. The added 4G LTE WiFi and Siri features became standard on both LT and LTZ trims, while the MyLink with Navigation feature was upgraded from optional to standard on the LTZ trim. The E85 capability feature is removed from retail orders. The Yukon XL, in addition to receiving the aforementioned features, sees the 6.2-liter EcoTec3 V8 engine being updated with the new 8L90E eight-speed automatic transmission for the interim model year, allowing it to improve fuel economy. The Yukon XL Denali however saw its MSRP bumped up by $1,300 in part due to the loaded features. All GM Full-sized SUVs received a body colored painted Shark Fin antenna as part of the 2015 mid-year refresh. For the 2016 model year (which commenced sales in July 2015), the Chevrolet Suburban received more upgraded changes and new features that included power-adjustable pedals, forward collision alert, IntelliBeam headlamps, lane keep assist and a safety alert seat as part of the newly introduced enhanced driver alert package as an available option on the LS trim. The inside floor console with storage area-SD card reader was removed, while a new AM/FM audio integrated system with Sirius XM, HD Radio, and CD/MP3 capabilities was introduced as a standard feature on all trims; the 8-inch MyLink feature was expanded to the LS trim and became standard (replacing the 4-inch display), although the navigation feature remains as an option on LT and standard on LTZ. A new liftgate shield was added to the Theft Protection Package, along with the new lane keep assist which replaced the lane departure warning. The capless fuel fill tanks became standard on all trims. Siren Red Tintcoat and Iridescent Pearl Tricoat became the new color trims, replacing Crystal Red Tintcoat and White Diamond Tricoat. The instrument cluster was re-configured with a new multi-color enhancement and a heads-up display was introduced as a standard only on the LTZ trim. The 2016 models also saw a price hike as well. The 2016 GMC Yukon XL also sees similar changes, with the new enhanced driver alert package as an available option on the SLE trim, liftgate, power, hands-free now packaged on SLT trims, a free-flow feature that replaced the Premium package, a lane keep assist added to all trims, and two new premium colors (Crimson Red Tintcoat and White Frost Tricoat) replacing Crystal Red Tintcoat and White Diamond Tricoat respectively. Chevrolet added Apple CarPlay and Android Auto Capability features to the Suburban starting with the 2016 models. However, only one of their phone brands at any one time can be used, while the Android Auto option will only be available on LT and LTZ trims featuring 8-inch screens. GM expanded newer 4G LTE features (like detecting battery failure and monitoring insurance discounts based on driver performance) to 2016 model year vehicles, including the Suburban, which GM cited as being the vehicle that is the most used among data subscribers. The 2017 model year Chevrolet Suburban received upgraded changes after it went on sale in August 2016. The level trims LS and LT are retained but the LTZ is renamed Premier, the latter serving as the equivalent to the Yukon XL Denali. The LS trims also saw the badged "LS" lettering removed. The new features includes two new colors (Blue Velvet Metallic and Pepperdust Metallic), two new 22-inch wheel options (a 7-spoke Silver wheels with Chrome inserts for all trims; Ultra Bright machined aluminum wheels with Bright Silver finish for Premier trim only), black roof rack cross rails (as part of the Texas Edition Package and All-Season Package), front active aero shutters (all trims), and heated and vented seats (Premier trim only). The MyLink was updated to incorporate Teen Driver, App Shop, Rear Seat Reminder customization, and Low Speed Forward Automatic Braking (as part of Enhanced Driver Alert Package on the LS trim, but standard on LT and Premier). The Rear Seat Entertainment System was overhauled to include a new video voiceover feature for the visually and hearing impaired, a HDMI/MHL connector, digital headphones, Digital Living Network Alliance (DLNA) technology incorporated into the Wi-Fi system, and a 2nd USB port with capability of charging up to a 2.1-amp at the back of the console. The 2017 model year Yukon XL also received similar changes, but with a few exceptions. Two new colors, Dark Blue Sapphire Metallic and Mineral Metallic were introduced, the latter exclusive to the Denali, which ialso added a new 22-inch ultra bright aluminum wheels with midnight silver premium paint and a head-up display to its features. The interior backlights changed from red to blue. The heated and vented driver and front passenger seats are now standard on the SLT and Denali trims. The 2018 model year Suburban had a few upgrades and deletions. The LED daytime running lights became standard on all trims, along with a new color, havana brown and satin steel metallic. The cocoa/mahogany interior that was combined with the pepperdust metallic exterior was dropped along with the wireless/inductive phone charging that was part of the Luxury and Texas Edition LT level trims. The fleet/commercial level trim, which had fewer features, is upgraded to include MyLink, HD Radio, multi-color driver information center, LED daytime running lights, and an optional driver alert package. The 2018 Yukon Denali XL received a new grille with a layered appearance like the ones on its redesigned 2018 Acadia and Terrain brands, featuring high-intensity-discharge headlights and LED daytime running lights. The refreshed design provides better airflow to the radiator, and when less cooling air is needed, shutters behind the grille close to improve aerodynamics and increase efficiency. The interior featured new ash wood trim that GMC says gives the cabin a richer appearance. A new 10-speed automatic transmission was mated to its 420-horsepower, 6.2-liter V-8 engine, replacing the 8-speed transmission. The 2019 Suburban will have both Havana Metallic and Tungsten Metallic deleted in favor of a new Shadow Gray Metallic exterior color, while the top of the line Premier will now have the name displayed on the tailgate. The LS trim continues to make HD Radio a standard feature, but can be deleted if customers opt for the OnStar feature. There has been industry speculation that the 2020 model will refine the aerodynamics by introducing front air curtains to improve efficiency and reduce drag. As of the 2018 model year, Chevrolet began offering “Signature Edition” package/trims of the Suburban. Each of the specialty versions are available at the LT and Premier level trims. On September 26, 2014, Chevrolet debuted the updated Z71 Suburban at the State Fair of Texas, along with the debut of the Texas Edition Suburban, the latter due to Texas having the largest units of Suburbans sold in the United States (As of August 2014, sales of the Chevrolet SUVs in Texas were up 37 percent) and to celebrate the 60th anniversary of GM's Arlington Assembly plant; production of the Z71 Suburban began in October 2014. As with the previous Z71 Suburbans, this version continued to be offered in a 4WD LT trim only, featuring a front skid plate, off-road tires mounted on 18-inch wheels, a unique grille, running boards and "Z71" identification inside and out. Fog lamps, front tow hooks and front parking assist are also included. The 2016 Z71 package was modified again, as portions of the Z71 items added on the Texas Edition package as an optional feature by request from customers was discontinued, making it a stand-alone package. The Texas Edition Suburban, which became part of the Texas Edition lineup along with the Tahoe and Silverado, was available in both LT and LTZ trims for the 2015 model year, featuring a maximum trailering package, twenty-inch polished aluminum wheels (on LT models), twenty-two-inch premium painted aluminum wheels (on LTZ models), and an exclusive "Texas Edition" badge. For the 2016 model year, Chevrolet discontinued the LTZ package but modified for the LT package without the requested Z71 features. The Suburban LT Signature Edition is an optional package trim, similar to the luxury package but with less expensive features, available in the LT level trim only. A Midnight Edition Suburban, an all-black optional package available in 4WD LT and Z71 versions, was introduced for the 2017 model year. This version became part of the Signature Edition Suburban feature for the 2018 model year. On August 13, 2018, Chevrolet introduced a more upgraded version of the top of the line Premier level trim of the Suburban, packaged as the Premier Plus, featuring a 6.2L engine, the classic gold bowtie emblems, chrome nameplate badging, and new polished 22-inch wheels. The interior is unique to these models, boasting with heated/ventilated Black-and-Mahogany leather front seats, Jet Black trim surround, a head-up display, and an eight-inch cluster. The exterior features standard cross rails, chrome power steps, and chrome exhaust tips. On April 6, 2017, Chevrolet announced that it will add a new package to the 2018 model year Suburban with the introduction of the street-themed RST (Rally Sport Truck) Special Edition Suburban. Originally at the time of the announcement, it was supposed to be available as an option for the LT and Premier trims as a Performance Package that included a 420-hp, 6.2L V-8 engine, a Magnetic Ride Control with performance calibration, and an all-new Hydra-Matic 10L80 10-speed automatic transmission. The press release also detailed additional features; The chrome elements are absent as body-color grilles surround the door and handles, along with an added gloss-black grille and mirror caps, black roof rails, window trim, badging and Chevy bowties, an exclusive 22-inch wheels wrapped in Bridgestone P285/45R 22 tires, a Borla performance exhaust system, massive front red Brembo six-piston, fixed aluminum calipers with brake pads clamping on larger-than-stock 410 mm × 32 mm (16.1 in × 1.3 in) Duralife rotors, coupled with an 84 percent increase in brake pad area and a 42 percent increase in rotor area to increase system thermal capacity. However, after the press release Chevrolet confirmed that the RST Suburban would only be available as an appearance package, as the 6.2L engine would not be used for the 2018 model year. But on May 4, 2018, Chevrolet expanded the RST package to the Suburban as an option for the 2019 model year that will now include the 10-speed automatic transmission and 6.2L engine, reversing a decision made by GM that it would be exclusive to GMC and Cadillac's Suburban siblings Yukon XL and Escalade ESV. The packaged trim went on sale in July 2018. A 2500HD Suburban became available in 2015 as a 2016 model. However, this version, identified as a Class 3 vehicle (around 10,000 to 14,000 pound GVWR), is only available for sale to rental companies and commercial fleet entities as a 4WD vehicle and will use the same design as the eleventh generation version, but uses a different engine altogether. The 2500HD Suburban is only offered in LS and LT trims, reserving the LTZ trim for a more luxurious offering (like limousine or taxi-related services). There is no 2WD or upgraded packages. In addition, there are no plans to offer a 3/4-ton GMC Yukon XL as GM is making the design exclusive to Chevrolet for the time being. A one-ton "Suburban 3500HD," which would be a GM-unique SUV, was introduced for the 2016 model year. This is government-exclusive and available in 4WD LS and LT trims only, weighing around 11,000 pound GVWR, 17-inch machined aluminum wheels (8 lug), a high capacity air cleaner, 220 amp alternator, external engine oil cooler and auxiliary transmission cooler. Although the vehicle has a high GVWR, it is configured to provide a minimal towing capacity and is primarily intended for conversion to an armored vehicle. This version does not include HD radio, nor is there a GMC Yukon XL equivalent, making this version exclusive to Chevrolet as well. There is no diesel variant of the full-size SUVs for the 2015 model year. GM offered another off-road variant or trim for the Suburban and Yukon XL starting with the eleventh generation. With the relaunch of the Z71 package in the Suburban, GM filed papers to trade mark the Trail Boss name for use on future Chevrolet truck and SUV models. Safety and fuel economy were the reasons for GMC to no longer offer an AWD in the Yukon Denali XL, and there are no volume controls or devices in the rear seating area to operate the DVD system. On November 4, 2013, Chevrolet unveiled a concept design for the Suburban called the Half-Pipe, whose features include roof racks and crossbars to mount skis, at the SEMA Show. Afterwards, Chevrolet made its parts available for order at Chevrolet Accessories. On February 12, 2014, Callaway Cars announced the addition of an upgraded supercharged package to the Suburban for an additional $17,000. On September 25, 2015, Corsa Performance added a cat-back exhaust system package for customers looking to upgrade their K2XX Suburban or Yukon XL, which would give the 5.3L versions a 669% flow increase and the 6.2L versions a 342% flow increase. On June 11, 2018, Freedom Mobility announced that it partnered with GM to have their trucks and SUVs equipped with features that will make it accessible to disabled and visible/hearing impaired drivers or passengers. The Suburban is among the selected vehicles that will be available with this option. The news of the redesigned Suburban and Yukon XL have so far been met with positive reviews from automotive critics who praised GM's devotion and commitment to keeping the Suburban and its sister SUVs in production due to their popularity and sales. A test drive that was done on February 25, 2014 received positive reviews for its speed, handling, technology, and performance from The Fast Lane, and an overall 9 rating (out of 10) from Canada's Autonet.ca. Truck Trend quoted that they never really thought of the Suburban and Yukon XL as "one-percent" vehicles (referring to their previous generations and its upper-class and family-oriented customers), they're now solidly "ten-percenters" with the updated versions. However at the same time it has seen mixed comments from message boards like Autoblog and Chevrolet's Facebook page, mainly about the front grille, its boxy design, GM's decision to not include additional or optional features to the Suburban, like a Duramax engine, and the conspicuous absence of the "2500" (or 3/4 ton) version in the current production lineup or making it available for sale to the public. In a review from Automobile Magazine, writer Greg Migliore notes that despite the reception from both sides and the possibility that other automakers might exit the large SUV segment, that with this 12th generation, "GM is clearly hoping the Suburban makes it to the century mark." The Detroit News gave the 2016 Suburban LTZ a 4 star (excellent) rating, this after comparing the SUV with the Fiat 500L in an experimental test inspired by Pope Francis's 2015 visit to North America, in which the Pontiff used the 500L, which is the equivalent of the President of the United States' armored Suburban The 2016 model also got a workout of sorts at the Florida International Rally & Motorsports Park to test its abilities on the racetrack, where it performed successfully. The 2015 Suburban was ranked third among the top affordable SUVs and fifth among affordable SUVs with 3-row seats by U.S. News & World Report, and was among the finalists in Motor Trend's SUV of the year for 2015. It also received a 2015 MotorWeek Drivers' Choice Award for best large SUV, while Consumer Reports ranked the Suburban as the best SUV with a third row seat, topping its competitors in this category. On May 31, 2016, the Chevrolet Suburban took third place behind the Tahoe and GMC Yukon in the 2016 J.D. Power Vehicle Dependability Study among full-size SUVs, based on responses from owners of the vehicles. Consumer Reports added the 2018 Suburban to their recommended list due to high owner satisfaction scores. The interest in the redesigned eleventh generation Suburban has also translated into surging sales. In April 2014 it saw a 109.8 percent spike with most dealers reporting that the vehicles are being sold within 10 days after it arrives on the dealership lots with customers opting for the fully loaded LTZ model, making it one of Chevrolet's fastest selling brands in 2014. The eleventh generation Suburban is also a hot seller in the Middle East, where in August 2014 posted a 37% increase in sales, with most of the purchases coming from Saudi Arabia (65%), the United Arab Emirates (15%) and Qatar (108%). By the end of September 2014, GM sold more than 4101 units of the Suburban (up 50.1%), while the Yukon XL posted 2165 units sold (up 64%), with GM boasting that 80% of the vehicles sold were its large SUVs. In Canada, sales of the Suburban reached 966 units (up 43%) in 2014, although the Yukon XL is the best seller in that country with 1,760 vehicles sold (up 50.3%) that same year. Overall, they account for 70 percent of GM Canada's SUV sales for 2014. On August 17, 2015, GM confirmed plans to increase production on its large SUVs, especially on the Suburban/Yukon XL, due to lower gas prices and a higher demand for the vehicles. The move also resulted in its Arlington Assembly adding more hours and increasing its production from 48,000 SUVs to 60,000 based on the expanding hours and added Saturday overtime shifts. The 2017 MY Suburban saw its biggest sales increase in January 2017, when it posted a 72.3% gain (5,634 units), the most ever since January 2008 when it had the 2008 MY Suburban. When production of the CUCV II ended in 2000, GM redesigned it to coincide with civilian truck offerings. The CUCV nomenclature was changed to Light Service Support Vehicle in 2001. In 2005, LSSV production switched to AM General, a unit of MacAndrews and Forbes Holdings. The LSSV is a GM-built Chevrolet Silverado 1500, Chevrolet Silverado 2500 HD, Chevrolet Tahoe, or Chevrolet Suburban that is powered by a Duramax 6.6-liter turbo diesel engine. As GM has periodically redesigned its civilian trucks and SUVs from 2001 to the present, LSSVs have also been updated cosmetically. 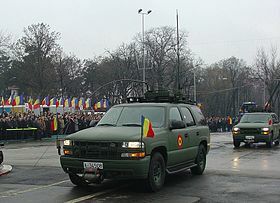 The militarization of the standard GM trucks/SUVs to become LSSVs includes exterior changes such as CARC paint (Forest Green, Desert Sand, or 3-color Camouflage), blackout lights, military bumpers, a brush guard, a NATO slave receptacle/NATO trailer receptacle, a pintle hook, tow shackles and a 24/12 volt electrical system. The dashboard has additional controls and dataplates. The truck also can be equipped with weapon supports in the cab, cargo tie down hooks, folding troop seats, pioneer tools, winches, and other military accessories. In the Canadian Army these vehicles are nicknamed "Milverado". The Enhanced Mobility Package (EMP) option adds an uprated suspension, 4-wheel anti-lock brakes, a locking rear differential, beadlock tires, a tire pressure monitoring system and other upgrades. About 2,000 LSSV units have been sold to U.S. and international military and law enforcement organizations. For the 2009 model year, the Suburban received the U.S. National Highway Traffic Safety Administration's (NHTSA) best rating of 5 stars in the frontal driver/passenger and side driver/passenger categories. For the 2015 model year, the Suburban received an NHTSA rating of 4 stars overall, with the side driver/passenger categories receiving 5 stars. (Because of more stringent tests, 2011 and newer model ratings are not comparable to 1990–2010 ratings.) The NHTSA gave the 2016 models 4 stars overall in its review, similar to its review of its 2015 models. It gave the Suburban an Acceptable rating along with the Tahoe and Yukon. The Escalade also got an Acceptable rating. 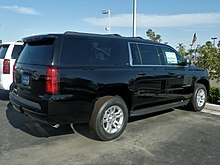 The Suburban, Tahoe, GMC Yukon and Escalade a Good rating and a Best Pick. However, all four including the Yukon XL got a Good rating for head protection in side and seats and head restraints. The Suburban, Tahoe, Yukon and Escalade earned a Good rating in the front offset. However, 2007–09 models without side airbags got a Poor rating. Models with them got a Marginal rating. 2010–14 models got a Top Safety pick. All of the K2XX SUVs received a top safety pick, except for the Chevrolet / GMC 1500 series pickups, which have not been tested. The pickups have been tested against the moderate overlap test, for which they received a good rating. On March 28, 2014, GM announced a recall on the 2015 Suburban and Yukon XL in order to fix a "transmission oil cooler line that is not securely seated in its fitting," causing the vehicle to stop and rupture the oil cooling line, resulting in the engine to malfunction and catch fire immediately. The move comes on the heels on an incident that happened on March 23, 2014, when a 2015 GMC Yukon caught fire in Anaheim, California during a test drive. Despite being an isolated incident, the 2015 Suburban and Yukon XL are not tied to GM's announced recall of its vehicles (from previous generation models and discontinued brands that were produced prior to, during, and after GM's restructuring in 2010) that was made on March 17, 2014. On June 6, 2014, GM issued another recall on the 2015 Suburban and Yukon XL because their radio control modules may not work, and thus prevent certain audible safety warnings. This would be followed on June 27 with another recall, in which the transfer case "may electronically switch to neutral without input from the driver," adding that if this occurs while the vehicle is moving, power will not be sent to the wheels, meaning that if the vehicle is parked, it may roll away unexpectedly if the parking brake has not been set. On December 5, 2014, GM announced that it is replacing ignition key units on the 2015 Suburban and Yukon XL after customers made complaints that the shift lever strikes the head of the key if the tilt-adjustable steering column is in the fully up position. The lever only can be moved out of "park" into a gear when the engine is running and the driver's foot is on the brake. The push-button ignition features are not affected. On January 4, 2015, GM issued a recall on tenth-generation Suburbans and Yukon XLs from the 2011 and 2012 model years for a potential ignition lock actuator issue, citing that they are not the right size and can cause the ignition to get stuck in the "Start" position, and then either due to a jarring event or a "cool interior temperature" the ignition could switch back to the "Accessory" position, resulting in a loss of power assistance and prevent the airbags from deploying. On December 30, 2015, the NHTSA revealed that it had received complaints from 2015 Suburban/Yukon XL owners about buffeting and vibration problems causing drivers and passengers to endure an annoying vibration inside the cabin so severe that it leads to dizziness and headaches. GM is aware of this and has moved to correct the situation and try to pinpoint the source, but assures the vehicles are safe to drive. On May 3, 2016, GM placed a recall on both 2016 model Suburbans and Yukon XLs over inadequate welds on their upper front control arms, which could result in an accident or injury. On February 4, 2017, GM issued a recall on 2016 and 2017 Chevrolet Suburban HD models over an improperly fixed right-hand rear-view outside mirror which GM says will replaced for free. The recall affected 211 vehicles. Beginning in 1999, GM re-branded the GMC Suburban as the Yukon XL. GM discontinued tracking sales of the Yukon XL in 2018 and now includes them with the sales of the Yukon. The sales on this chart reflect the number of Chevrolet Suburban units sold from 2018 onward. ^ "Everybody Loves the Suburban". August 27, 2010. ^ "Vehicles used by Secret Service". Government Police Cars Web Site. ^ Blackley, Julie. "The Cars People Drive the Most". iSeeCars.com. ^ "Arlington 10 Million Celebration Adds to Suburban's Legacy". media.gm.com. Retrieved 2018-09-23. ^ a b c d e f Dammann, George H. (1972). Sixty Years of Chevrolet. Crestline Publishing. ISBN 978-0-912612-03-4. ^ a b "1948 Chevrolet Trucks Brochure". Oldcarbrochures.com. Retrieved January 16, 2012. ^ "Chevrolet Suburban: Evolution of an Icon". April 2, 2014. ^ a b "1954 Chevrolet Trucks". Oldcarbrochures.com. Retrieved January 16, 2012. ^ "1955 Chevrolet Truck Operators Manual". Oldcarbrochures.com. Retrieved January 16, 2012. ^ "1956 Chevrolet Truck Operators Manual". Oldcarbrochures.com. Retrieved January 16, 2012. ^ "1957 Chevrolet Truck Operators Manual". Oldcarbrochures.com. Retrieved January 16, 2012. ^ "1955 Chevrolet Truck Operators Manual". Oldcarbrochures.com. p. 4. Retrieved August 25, 2012. ^ a b c d "1964 Chevrolet Suburban Brochure". Oldcarbrochures.com. Retrieved January 16, 2012. ^ "1960 Chevrolet Suburban". Oldcarbrochures.org. p. 4. Retrieved October 22, 2012. ^ "1964 Chevrolet Suburban Brochure". Oldcarbrochures.com. Retrieved January 16, 2012. ^ "1969 Chevrolet Suburban Brochure". Oldcarbrochures.com. Retrieved January 16, 2012. ^ a b "1969 Chevrolet Suburban Brochure". Oldcarbrochures.com. Retrieved January 16, 2012. ^ "1971 Chevrolet Suburban Brochure". Oldcarbrochures.com. Retrieved January 16, 2012. ^ "Chevrolet" (in Portuguese). Lexicar Brazil. Retrieved February 20, 2015. ^ "1973 Trucks and_Vans album". Oldcarbrochures.com. Retrieved January 16, 2012. ^ "1973 Trucks and Vans album". Oldcarbrochures.com. Retrieved January 16, 2012. ^ "1982 Chevy Suburban (brochure)". Chevrolet Motor Division. August 1981. p. 2. Archived from the original on February 14, 2010. 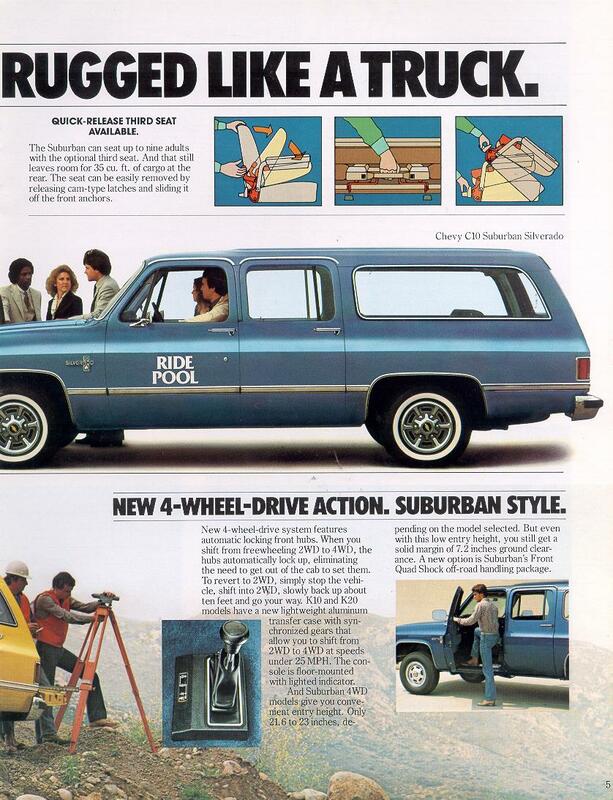 ^ "1981 Chevy Suburban (brochure)". Chevrolet Motor Division. July 1980. Archived from the original on February 14, 2010. ^ a b Gunnell, John (1995). Standard Catalog of Chevrolet Trucks. Krause publications. ISBN 978-0-87341-364-0. ^ See the 1997 ACDelco Spark Plug catalog, pp. 181-183. ^ a b c d e DeLong, Brad (1996). 4-Wheel Freedom. Paladin Press. ISBN 978-0-87364-891-2. ^ "Compare Side-by-Side". Fueleconomy.gov. Retrieved March 11, 2012. ^ "General Motors Passlock Security System". ^ "Car review – Holden Suburban 1500 LT 5-dr wagon". GoAuto. John Mellor. May 10, 2001. Retrieved October 6, 2007. ^ Davis, Tony; Kennedy, Alistair; Kennedy, Ewan (February 2007). "The Holden Heritage – 13th Edition (Part Three)" (PDF). GM Holden. p. 109. Archived from the original (PDF) on September 16, 2010. ^ a b Kenwright, Joe (June 26, 2007). "Used Car Advice: Holden Suburban (1998–2000)". Carsales. Archived from the original on November 30, 2010. Retrieved October 6, 2007. 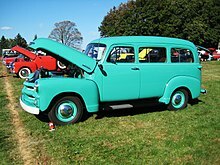 ^ "Holden Suburban". Red Book. Automotive Data Services. Retrieved April 5, 2010. ^ a b c d e f "Holden Suburban 1500 LT 5-dr wagon – The Car". GoAuto. John Mellor. May 10, 2001. Retrieved October 6, 2007. ^ a b "NRMA Car Review – Holden Suburban". NRMA. June 1998. Archived from the original on February 1, 2008. Retrieved October 6, 2007. ^ Carey, John (February 25, 1999). "Worth the weight?". Drive. Archived from the original on July 22, 2011. Retrieved August 13, 2007. ^ "Thirst encounter". Drive. February 25, 1999. Archived from the original on July 22, 2011. Retrieved October 6, 2007. ^ "2006 GenIII V8 Truck (LQ4).xls" (PDF). Archived from the original (PDF) on October 15, 2009. Retrieved September 21, 2009. ^ "2003 GMC Yukon Owner's Manual" (PDF). General Motors Corporation. June 24, 2002. Archived from the original (PDF) on July 4, 2012. ^ a b c The Car Design yearbook 5. Merrell. 2006. ISBN 978-1-85894-318-3. ^ "2010 Chevrolet Suburban". US News & World Report. August 27, 2009. ^ Harley, Michael (February 10, 2010). "Chicago 2010: Chevrolet celebrates Suburban's 75th Anniversary with Diamond Edition". Autoblog. Retrieved February 17, 2010. ^ "2011 Chervrolet Suburban: forging Ahead in Its 76th Year". Conceptcarz. July 2010. Retrieved August 25, 2012. ^ "2012 Chevrolet Suburban Overview". AOL Autos. October 2011. Retrieved August 25, 2012. ^ "GMC debuts 2012 Yukon and Sierra Heritage Editions". Autoblog. March 30, 2012. Retrieved August 25, 2012. ^ "Here Are The Changes to the 2013 Chevy Suburban: RPO Central". GM Authority. May 21, 2012. Retrieved August 25, 2012. ^ rayadmin (July 28, 2015). "2014 Chevrolet Suburban". ^ "Janesville Assembly Fact Sheet (GM)". Media.gm.com. December 16, 2009. Retrieved June 24, 2011. ^ "GM North America September 2010 Production by Plant" (PDF). Retrieved June 24, 2011. ^ "vehicle body exterior" (PDF). ^ "Competitive Comparison". gmc.com. Archived from the original on April 17, 2014. Retrieved April 17, 2014. ^ "2017 GMC Yukon And Yukon XL Get New Colors, Wheels, Front Active Aero Shutters, Revamped Rear Seat Entertainment And More". GM Authority. August 8, 2016. Retrieved August 11, 2016. ^ "2017 GMC Yukon XL / Denali order guide" (PDF). GM Authority. August 5, 2016. Retrieved August 11, 2016. ^ "Like Next Chevy Tahoe, 2020 Suburban To Feature Air Curtains". GM Authority. Retrieved 2018-10-05. ^ a b c d e f "Light Service Support Vehicle (LSSV)". Olive-Drab. Retrieved April 16, 2014. ^ "Safercar.gov". Safercar.gov. Archived from the original on April 29, 2009. Retrieved May 7, 2009. ^ "2016 Chevrolet Suburban Earns Four-Star Safety Rating From Federal Government". Edmunds. July 15, 2015. Retrieved July 15, 2015. ^ "Safercar.gov". Safercar.gov. Retrieved June 9, 2014. ^ "2016 GMC Yukon Denali SUV 4WD". National Highway Traffic Safety Administration. Retrieved September 30, 2015. ^ a b "GM reports robust December sales; leads industry in truck sales during second half of 1999" (Press release). Media.gm.com. January 5, 2000. Archived from the original on June 2, 2004. Retrieved July 19, 2009. ^ a b "GM's 'Industry Leading Truck Lineup' Sets Calendar Year Industry Sales Record" (Press release). Media.gm.com. January 3, 2002. Archived from the original on March 14, 2004. Retrieved July 19, 2009. 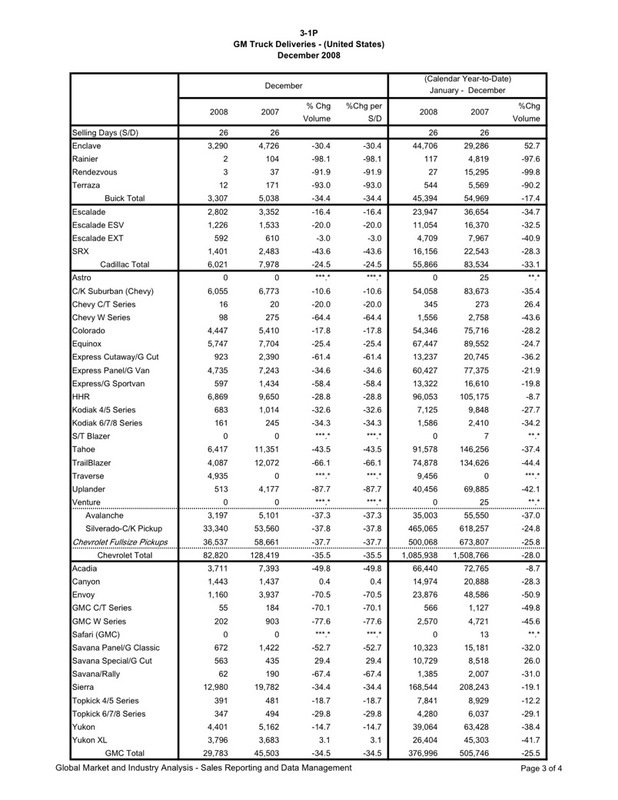 ^ a b "GM Reports December 2005 and Year Results". Theautochannel.com. January 5, 2006. Retrieved June 1, 2009. ^ "GM Reports 341,327 Deliveries in December" (Press release). GM Communications. January 3, 2007. Archived from the original on June 21, 2007. Retrieved June 1, 2009. ^ a b "GM truck deliveries (United States)". jalopnik.com. December 2008. Archived from the original on May 15, 2013. Retrieved August 26, 2012. ^ "Deliveries December 2009" (Press release). General Motors media. Retrieved August 26, 2012. ^ "GM U.S. deliveries for December 2010 – divisional brand level" (PDF) (Press release). General Motors media. Retrieved August 26, 2012. ^ "GM U.S. deliveries for December 2011 – divisional brand level" (PDF) (Press release). General Motors media. Retrieved August 26, 2012. Wikimedia Commons has media related to Chevrolet Suburban.